“Radiolarian” is the word generally used to denote a large family of microscopic sea animals that includes radiolaria (silica-based), acantheria (strontium-based) and foraminifera (calcium-based) – hundreds of tiny creatures found in the oceans throughout the globe. 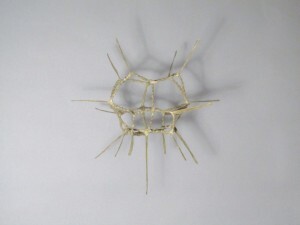 My focus on this group for the Voyage of Discovery show was inspired by a 2012 article in The Journal of Micropaleontology that describes how species of radiolarians usually only found in tropical waters are more frequently being found in the Arctic. Because these animals rely on ocean currents to carry them while alive and their hard “skeletons” endure after they die, they are an interesting measure of change. The significance of this change, and the many possible reasons for it, inspired me to make this series called Invasive Species. 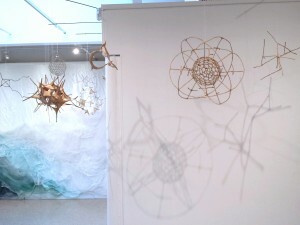 The sculptures are high-shrinkage flax paper over steel wire, ranging from approximately 1 to 3 feet in diameter. The show traveled to the McLean Project for the Arts in September 2014 and some of the pieces from this series will be featured in a show in February – April 2015 of this year’s DC Commission on the Arts and Humanities arts fellowship grants. 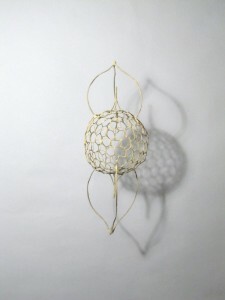 The radiolarians are designed to be hung in loose groups, hanging above the heads of visitors as tough floating through the ocean. 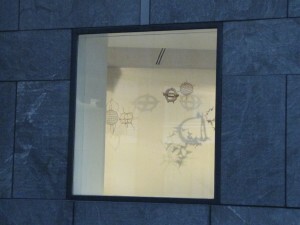 They respond to slight changes in air flow and cast dramatic shadows on the walls nearby. As with much of my work, while I knew that shadow and movement would play some role in the final piece once installed, I started to work on the series with the forms of the individual elements in mind. I did research into which species were migrating to the arctic, drawing on the wonderful online resources for such research, especially Radiolaria.org and an archive on the site 19thcenturyscience.org that includes all of the plates from Ernst Haeckel’s Challenger voyage. 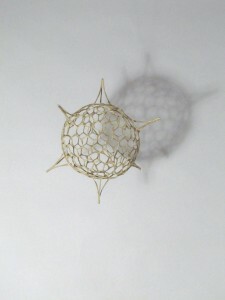 In the end, I decided to build pieces that were most compelling to me as pure form and happen to be radiolarians (for the most part) instead of sticking to a strict list of only those that were changing their migratory pattern. I even built a few structures that I have not been able to match to particular radiolaria (although, with hundreds of species and such a wide range of forms, I wouldn’t be surprised if they turn out to be “real” after all). 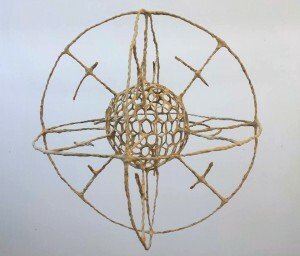 This entry was written by beelsebub, posted on February 8, 2015 at 11:24 am, filed under General, Science-themed art and tagged microscopic, radiolarians, sculpture. Bookmark the permalink. Follow any comments here with the RSS feed for this post. Post a comment or leave a trackback: Trackback URL.